CommuniKate 20 on an iPad via the online demo. Nine months ago I started working with Kate McCallum on a project that was pretty important to both of us. You will remember Kate from showing us how to hack a switch and from giving us a guide to creating a tactile overlay. Some years ago Kate built a page-set called CommuniKate for her little brother. 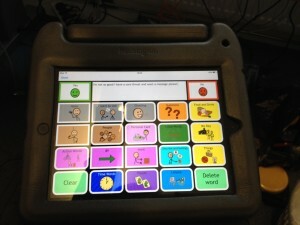 Fifteen years of AAC experience later this page-set has been used by people with a wide range of needs and on a diverse array of devices. In January this year we found some time to compare notes at BETT. We’d both been convinced for some time that the AAC world needed open-access transferable page sets that could be used by any user on any device. I’d been researching the issue since 2010 and Kate is a veteran had years of supporting users who had been switched from one page-set to another. CommuniKate 20 running on Grid Player. We decided that CommuniKate should be the first open-access transferable page set. Nine months of hard slog later, it is. Releasing a page-set is a lot of work. There were a few different layouts of CommuniKate that Kate had to draw from to create the ‘master’ version. Every icon had to be redone using creative-commons images so that we could release the whole set under an open licence. The manual had to be written. A demo had to be coded up. We had to port the master version of CommuniKate 20 over to our launch systems. Because we’re releasing it openly people can download, use, modify and share CommuniKate and the manual without having to worry about permissions. And because it’s clear we where not going to make any money out of it we found we had a lot of help. Will Wade of the ACE centre stepped in for two of the translations, Paulo Ricca coordinated the team that gave us a Portuguese translation. The guys at DART have just started a Swedish one. SLTs stepped up to give us feedback on structure, nerds stepped up to give us feedback on code. Proofreaders, family, and friends pulled together for us on this one and we are incredibly grateful. We received material contributions from the guys at AssistiveWare and at CoughDrop, who recognised that this isn’t about competition – it’s about making the whole area stronger. The CommuniKate homepage is at this link. We’d like you to explore the demo, have a glance through the manual and generally look around. If people have feedback, please don’t hesitate, if people would be willing to help translate even five slides to another language or please don’t hesitate. And if you are willing to transfer CommuniKate to a device not on this list, then definitely don’t hesitate. Is the disability market inventive and diverse enough? Excellent idea. Our speech therapy newsletter is on hiatus while we work on our new web based speech therapy app. But as soon as it gets going again I’ll send something out about this. (Filing it away under my backlog of article ideas). We are just about to launch our tabtoob mark 2. I would love to start a conversation to see if we could be of use to each other to promote accessible independent communication for all. I am a parent of a child with learning difficulties, and was excited when the link to this page was sent to me. But I am disappointed – the language used is technical and not geared towards overstressed. What is a ‘first open-access transferable page set.’, please? My daughter has never used communication aids, so whereas this lingo may be fine for people who are used to such supports, it is alienating for those of use who aren’t used to it. Apologies Judith, I had thought I’d responded this, very sorry. You raise a sensible point and it’s one that Kate and I have been talking over. Currently we’ve got a distinction between this blog post which is aimed at my more technical readers, and the project pages (http://joereddington.com/projects/communikate/) which are aimed much more at therapists and families. What’s missing is an FAQ-style document aimed specifically at families and users. It’s great that you comment = it really helps us set priorities as we build up the project.